Advantages: High quality production; comprehensive coverage of the specific project; lots of handy general modeling tips; easy to use menu; accessible presentation style. 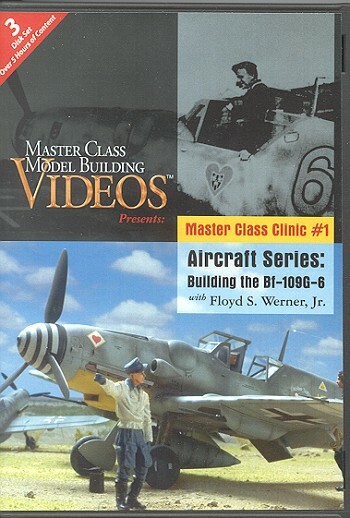 Master Class Model Building Videos is a new enterprise and this DVD is their first endeavour in providing the modeler with a video resource to aid in their building. It is produced by modeling enthusiasts who know what modelers would like to see. This first in hopefully a long series of instructional videos covers the building of the Hasegawa Bf-109G-6 in its entirety starting from right after the parts are removed from the box through basic assembly, painting, and final assembly. A lot of us have been building models off and on for quite a few years, myself for around 35 years, but I learned a technique or two on the basic building section that should make my model building easier and hopefully a little more neat. I have seen frequent questions on our site on pre-shading, using an airbrush, using Future, and a multitude of other questions, a lot of those questions are answered on this video in a very clear manner by Floyd. Watching Floyd’s techniques with the airbrush makes it look easy although I know it takes lots of practice, but seeing how he achieved the different effects has finally prompted me to pull out my airbrush and give it a try. Floyd builds the model right out of the box, the only aftermarket item he used was some aftermarket decals by Eagle Edition. There is an area on the side of the flaps that has a gap and isn’t the easiest to fill, the video has an insert card with information on what is on each DVD, there is also a template for cutting end caps for the flaps out of thin plastic for an easy solution to that problem. Also included on the insert card is a suggested list of tools and paints to finish the model. On the DVD’s I was really impressed by the section on airbrushing, mostly because that was pretty much a black art to me. Floyds technique for weathering the model in multiple steps was simple but so realistic. I have read numerous articles and threads on message boards on how to achieve these effects, but it wasn’t until I saw it actually being applied that I finally understood how to do it, nothing really beats seeing it done. Also covered in detail is weathering with pastels. The DVD will run nonstop from start to finish, at the beginning there is a very easy to use menu with each section so you can always come back to review a section without any hassles, I know I will be going back quite often. Sometimes there is a problem living in one part of the world and buying a DVD from another, the publisher took that into consideration and has made this set so it will be able to run on 95% of the DVD players around the world. I hope more videos come out in this series, even to people who have been modeling for years, there could be something to learn to help make your model just that much more realistic. For a beginner or someone just getting back into the hobby after a long time off, this would be invaluable. I learned quite a few things and a number of times found myself thinking that’s an easier way than I was doing it in the past. After I finished watching it I made a trip to the hobby store to pick up more supplies, I even picked up a Pro Modeler 109 to try my hand at it, it was that good. I would like to thank Master Class Model Building Videos for the review sample.